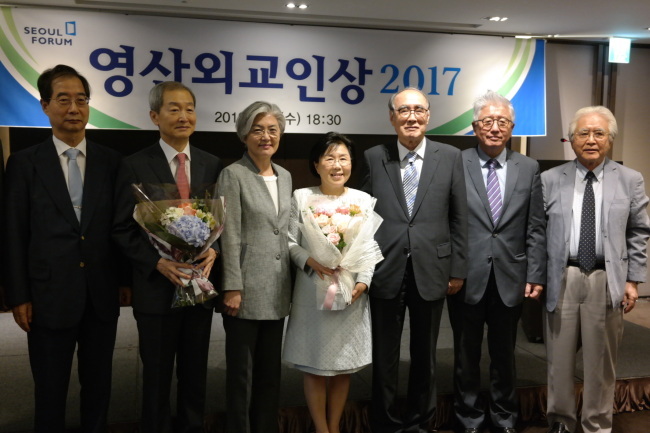 Choi Jung-wha, president of the Corea Image Communication Institute, received the Yeongsan Diplomat Award on Wednesday for her decadeslong efforts to uplift Korea from obscurity to the world’s limelight. The annual award given by the Seoul Forum organization recognizes individuals who made consummate endeavors to enhance the nation’s image and interests around the world. Choi was honored alongside former South Korean Ambassador to the United States Ahn Ho-young. “South Korea’s diplomacy has seen immeasurable developments over the years, and it was only possible through people like Ambassador Ahn and professor Choi and their hard work,” said Foreign Minister Kang Kyung-wha at the awards ceremony held at Plaza Hotel Seoul. In 2003, Choi, a professor at Hankuk University of Foreign Studies in Seoul, founded CICI, a nonprofit organization for public diplomacy registered under the Ministry of Foreign Affairs. “I launched CICI in 2003 at a time when the world’s attention was beginning to build up on the Korean Peninsula on the back of the 2002 World Cup and the North Korean nuclear crisis of 2003,” Choi said upon receiving the award.